What it's really (no really) like living with two teenage daughters, one husband, two cats and a dog. Plus recipes, because who doesn't like a recipe? Pick ’em where they grow! We create rituals in our lives, traditions. They give us a point of reference, a shared experience, something to punctuate the passage of time. Autumn begins some of the most honored traditions in our house, our own spin on the commercial holiday parade that begins with Halloween and ends with New Years. 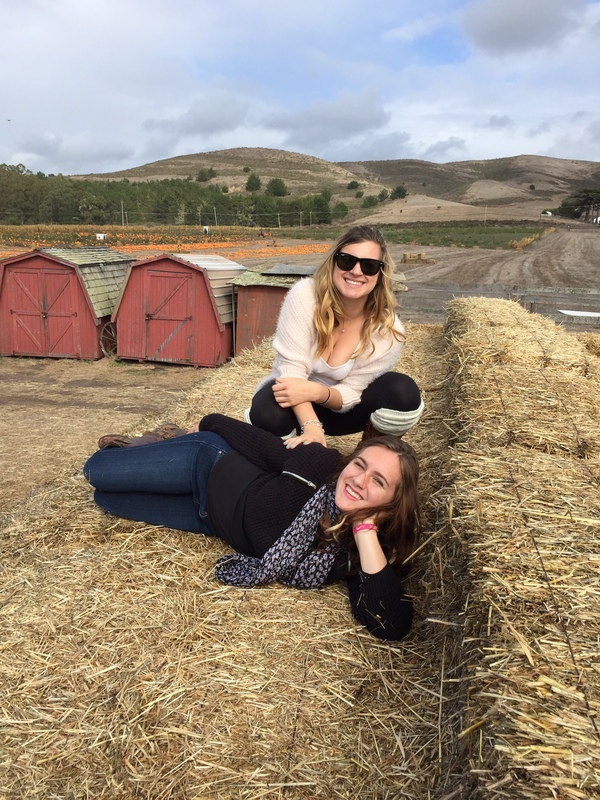 Sometime in mid October we make the pilgrimage 30 miles south to the town of Half Moon Bay to select the perfect pumpkin at Bob’s (Pick ‘Em Where They Grow) Pumpkin Farm. 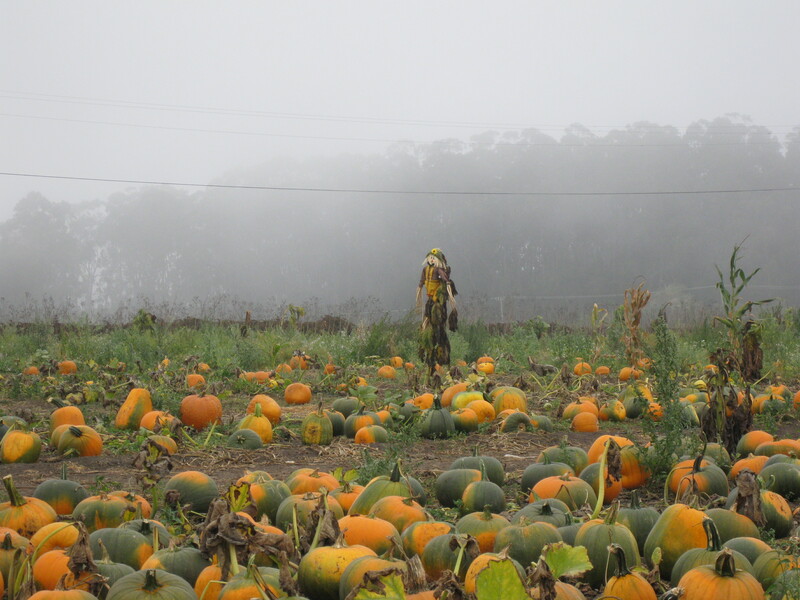 Half Moon Bay is the pumpkin Mecca of the Bay Area with a dozen or so patches to choose from. They run the gamut, from full carnival style patches with hay and pony rides, and corn and hay mazes, and perfectly shaped pumpkins neatly arranged by size, to actual farms where the pumpkins are left in the fields in which they were grown. Sixteen years ago, when daughter 1.0 was two years old and I had just finished the first trimester with 2.0, we found Bob’s. We had driven south the weekend of the Pumpkin Festival having been told that it was a not to miss event, mandatory really if you had kids. We fought the traffic and drove past Lemos and Pastorino finding no place to park amid the music blaring and the flags flying. I’m not at all sure why we continued south on Highway 1. Maybe we had given up of the idea of pumpkins and festivals and patches and were just trying to get home and thought we would take the long way round to avoid the traffic. But I do remember seeing the hand painted sign for Bob’s, and we must have decided to give it a try. Bob’s sits on it’s own out on Highway 1 south of Half Moon Bay with a view of the Pacific Ocean. There’s a large dirt parking lot and a farm stand (open all year round) and an enormous field of pumpkins. In the first years we went they had a corn maze, but drought put an end to that several years back. They’ve added “attractions”: a tall stack of baled hay you can climb and jump from, a small farm animal petting “zoo” with pigs and goats and rabbits and a strutting turkey, a rusted old pick up truck for photo ops and at one time a broken down tractor that you could “ride.” There are no speakers blaring music and rarely any crowds. It is where we have gone every year for the past 16, save one when we missed because of over-scheduled children and I sank into what I shouldn’t call a full blown depression but certainly a fair amount of melancholia that didn’t lift until I started planning the Thanksgiving menu. We’ve added to this tradition over the years. After reading a New York Times article on tacos up and down the California coast my Husband insisted that we make a stop in the tiny town of Pescadero, south of Half Moon Bay, for gas station tacos. Now we get tacos at the gas station and look for our first Christmas ornament of the year in one of the gallery/shops in town. And more times than not there are tears, because of the wrong pumpkin, the wrong picture, it’s too hot, it’s too cold, it’s my turn to push the wheel barrel, why do you get to pick two pumpkins when I only get one? There’s always some sort of a fight. Why then do I insist on going every year? Why is it one of the things I look forward to so much and look back on so fondly? It’s tradition. And besides, similar fights and bickering would happen at home anyway, so why not head to Bob’s? Daughter 1.0 will be in college next October, then 2.0 two years after that. This may have been the last year that the four of us go to Bob’s. When we put the pumpkins into the back of the car and the girls walked over to the hay pyramid I looked out to the ocean and this year I was the one who cried at the pumpkin patch. Earlier in the day rinse the chickens and remove the large fat flap from the opening of the body cavity (and any giblets etc that are in there). Put the chickens into a large bowl and take a handful of kosher salt and sprinkle into the body cavity and rub all around the skin. Cover the bowl and set the chickens in refrigerator. About two hours before you want to eat, remove the chicken from the fridge and let come up to room temp for about thirty minutes. Cut the crusts from the bread. (Discard the bottom crust, but the top and side crusts make terrific crackers for cheese.) Cut the bread into large chunks and rub with olive oil. Put the chunks of bread under the broiler and brown, flipping to get all sides. Be careful not to let the bread char too much. When they are browned, remove from the oven and let cool. Preheat the oven or a gas grill until very hot (500 degrees). Dry the chickens with paper towels. Heat two oven proof skillets on the stove on high (or in the gas grill or oven) until hot, then at the chickens, breast side up. The pan should sizzle. Put the pans into the oven or the on the grill with the lid down. They should take about an hour to cook. While the chicken is cooking, tear the chunks of bread into bite sized pieces and place in a large mixing bowl. Whisk together about 1/4 cup of olive oil with 2 tablespoons of champagne vinegar and season with salt and pepper. Toss this vinaigrette with the torn bread. Place the currants or cherries or raisins in a small dish and cover with red wine vinegar and set aside. Place the pine nuts into a small oven proof skillet and pop into the oven for a few minutes to toast. Remove from the oven and add the pine nuts to the bowl with the bread. Pour a tablespoon or so of olive oil into the skillet you had the pine in and put over medium low heat. Add the shallots and stir to sauté without browning. When soft, scrape the shallots into the bread mixture. Drain the currants and add to the bowl with the bread. Toss everything to combine, then pile into a casserole dish and tent the top with foil. When the chickens are almost done, place the bread salad into the oven for about 8 minutes. Remove the bread salad and chicken from the oven (grill) when the chicken is cooked through (160 degrees on a thermometer inserted into the thigh). Put the bread salad into a large salad bowl and toss with the salad greens. Remove the chickens from the pans and deglaze the pans on the stove top with a little bit of vinegar, then sprinkle the bread salad with these pan drippings to taste. Season the salad with salt and pepper (taste first as it may already have plenty of salt). Carve the chicken and serve it with the salad.